Farm to fork, locally grown and all of the other progressive terms for agriculture self-identification leave out one important fact: People would starve. Seattle, for example could feed 4 percent of its population with P-Patches and backyard gardens teeming with kale. Organic agriculture for the masses is a popular myth but urban agriculture is a plain old pipe dream. And 4 percent may be the high number, it could be more like 1 percent, according to a new University of Washington study - that's even if all viable backyard and public green spaces were converted to growing produce. The results show that it would require a 58-mile expansion around the city to meet 100 percent of Seattle's food needs. In other words, conventional agriculture with food shipped in. But a lot of people in urban areas believe food security is possible locally. The researchers combined imagery and available Lidar data for Seattle, which are captured by flying aircraft and scanning the landscape with lasers. The resulting 3-D data are useful for geologists and geomorphologists looking at topography and landslides, but also for measuring tree cover in a city, including the height and leaf density of individual trees. Because Lidar lets researchers see a 3-D version of a city, down to an individual tree or building, it can also figure out how much sunlight hits an area -- and how likely a food crop could flourish in that spot. The researchers combined this data with nutritional information from the National Nutrient Database that assesses the calories, macronutrients and micronutrients in each food group. They analyzed nutrients needed for a vegetarian diet, because growing vegetables, grains and nuts usually requires less land than raising livestock for meat. In order to meet the nutritional needs of an adult eating a vegetarian diet, only about 6,000 people (1 percent of Seattle's population) could be fed if all single-family backyard space were converted to farming. That number rises to about 24,000 people (4 percent of the population) if all additional public green spaces were converted. It's an eye-opening figure and it forces urban idealists to really think about what must be eaten to survive. A city can grow tomatoes, kale and lettuce but it gets more complicated once you factor in other necessary proteins, fats and carbohydrates that often travel from across the county and world. 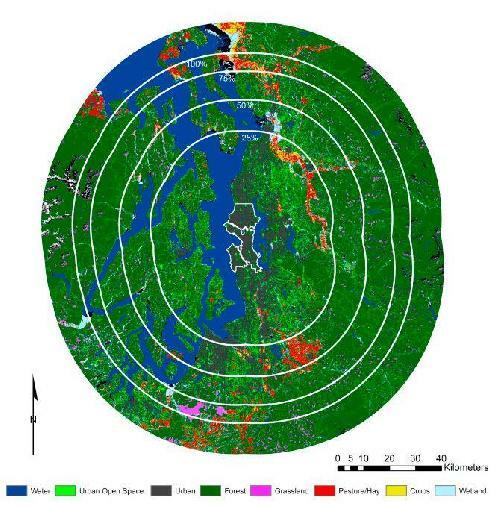 The researchers say their model can be used by other cities that have good geospatial data on sunlight and tree cover if planners input the relevant crops that grow well in a particular area. A sunny, sprawling city like Los Angeles, for instance, might be able to grow more crops than Seattle. "If food sustainability is something that a city is really interested in, then this is a way you can test it," said lead author Jeff Richardson, a postdoctoral researcher in the University of Washington's School of Environmental and Forest Sciences. "In refining this study, we really factored in all the different nutritional aspects of the diet to make sure there was a baseline way you could assess this for any city based on a diet that works and keeps people alive." Published in Urban Forestry&Urban Greening.